The historic football clash between the senior and junior girls happened Friday, but future Powder Puff games may be in jeopardy because of some unruly fans. According to high school principal Philip Gale, the Powder Puff games could be eliminated if students attending or participating in the event conduct themselves in an inappropriate manner. The students who participated this year played in an appropriate manner, he said. “I think powder puff shouldn’t ever get canceled because it is for charity,” said Joey Timmons, a Junior powder puff coach. Over the past few years students reportedly have gone to the games under the influence of alcohol. These incidents had the school considering to end the event because the student fans were getting in trouble for being belligerent. “It’s just immature for students to ruin a fun charity event for people in need,” said Timmons. Powder puff was on the turf field at the high school at 6p.m. It was a flag football game with the junior and senior girls. The senior girls dominated the first half, led by senior quarterback, Laura Wissler. At the end of the first half the score was 18-0, seniors. The juniors came out at halftime ready to switch the momentum. Led by junior quarterback, Lindsay Hutchinson, they quickly scored making the game closer. Even though the juniors continued to fight back in the second half, the seniors still won with a final score of 26-14. Players and coaches sold the tickets for $3 in advance and the tickets were $4 at the door. All proceeds went toward the Penn Manor Family fund. Prior to the game this past week, some male students raised money to become Powder Puff King, the student with the most money was the winner. The students who ran for Powder Puff King included Bob Warfel, Errol Hammond, Landon Alecxih, Austin Richwine, Dylan Weber and Cody Stryker. Bob Warfel was crowned king for raising the most money. There were about 30 junior girls playing and their coaches were Kyle Musser, Joey Timmons, Joziah Rodriguez, Brandon Stone, Adam Sahd and Adrian Viruet, all of whom are junior football players. The seniors had a small showing, with only about 15 girls out for the team. The senior football players who coached include Cody Stryker, Dylan Weber, Errol Hammond and Brian Sloss. The people who participated this year did an outstanding job and raised a tremendous amount of money said Gale. 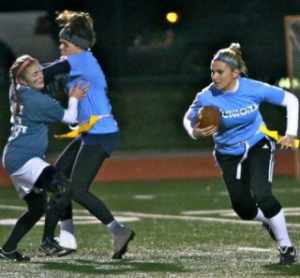 For now, powder puff is still a functioning fundraiser event, but it may be gone in upcoming years. Hear Ye Hear ye, This is your king speaking. I am very pleased with the amount of money we raised. Great job juniors and seniors on making powder puff a success. Please continue the tradition. No one will raise as much money as I did, but I am sure we can keep helping out the good cause PowderPuff represents!